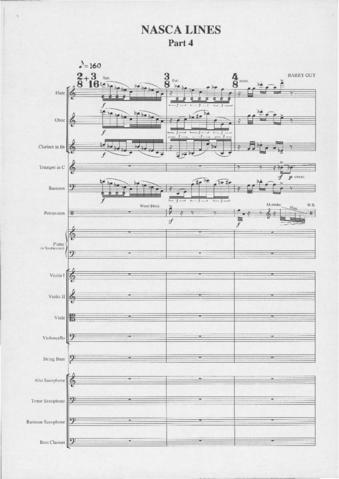 Item is a complete conductor's score for part 4 of Nasca Lines, predominantly in standard notation with the exception of the last two pages, which are in graphic notation. Part 4 uses pitch-class set sequences and features the wind ensemble (flute, oboe, clarinet, trumpet, and bassoon) with significant inputs from piano and percussion. The time signatures change regularly and include some mixed meters.